Meditative reflection - the strengthening of thinking and feeling through the will - is one of the main methods of experiencing Anthroposophy. "The best path to this goal", says Sergei Prokofieff, "is inner work with the Foundation Stone Meditation, because this meditation is the quintessence of the whole of Anthroposophy, given in meditatively inspired form by means of earthly words." 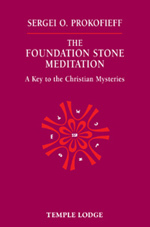 Rudolf Steiner characterized the content of the Foundation Stone Meditation as having been spoken by him 'out of the will of the spiritual world', as 'verses heard from the Cosmic Word'. Due to its spiritual-mantric form, its text represents the characteristics of an archetype, and for that reason is a key to the most diverse areas of world and human existence. Depending on "which spiritual portal is opened with this key", explains Sergei Prokofieff, "one arrives at one result or another, and one and the same line of the meditation becomes a reply to the most varied questions". Prokofieff applies the above method in this impressive work, illuminating various dimensions of spiritual science in the process. His research embraces, among other aspects, the relationship of the Foundation Stone Meditation to the being Anthroposophia, the spiritual hierarchies, human karma, the Rosicrucian, Michaelic and Grail streams, the Mystery of Golgotha, the two Jesus boys, the three spiritual sources of Anthroposophy, and even the Constitution of the Anthroposophical Society. SERGEI O. PROKOFIEFF, born in Moscow in 1954, studied painting and art history at the Moscow School of Art. He encountered anthroposophy in his youth, and soon made the decision to devote his life to it. Since 1982 he has been active as an author and lecturer. In 1991 he became a co-founder of the Anthroposophical Society in Russia, and since Easter 2001 he has been a member of the Executive Council of the General Anthroposophical Society in Dornach. Eighteen of his books are currently published in English translation, including his recent major work May Human Beings Hear It!